There is by no means a shortage of teams working on low-cost 3D printers. Kickstarter is absolutely overflowing with them. But, as many of those teams quickly realize, shipping hardware is hard. A challenger approaches! 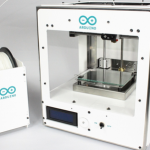 Arduino, the company best known for building and shipping the absurd number of microcontrollers that power many a DIY electronics project, is about to enter the 3D printing market. Arduino made the news official today, announcing a partnership with Italy’s up-and-coming printer manufacturer, Sharebot. Their first printer will be called the Materia 101, and is built to print in PLA. While they’re holding off on announcing the exact price for now, they’ve ballparked two different models: a pre-built package that will sell for “less than 1000 USD”, and a DIY kit that will go for “less than 800 USD”. Is it the prettiest printer in all the lands? Nah — it looks a bit like the super early MakerBot Cupcake machines, albeit white. Does it have the biggest print bed? Nah — see below for the specs there. But it’s exciting to see a company like Arduino, with its damned impressive ability to scale and its tendency to opensource everything it does, get into the space. Posted in 3D Printers, Arduino. Bookmark the permalink.